One of the most important factors for the success of ERP software implementation is end-user training. If the end-users of the software do not know how to work on it, then the software will not yield the desired result; which means your ERP implementation will fail. In many organizations, end-user training is usually an afterthought in most ERP projects. This is because the ERP implementation partners only train the trainers and are very expensive, so the budget becomes unviable when it comes to end-user training. In addition to this, organizations may not have a specialized team to develop these training programs. In such situations, what organizations can do? There can be one solution! Wondering what’s that? E-learning development using rapid authoring tools. Rapid authoring tools make the online ERP end-user training development process easy and cost effective with their built-in features? As there are many authoring tools, confused which one to use? 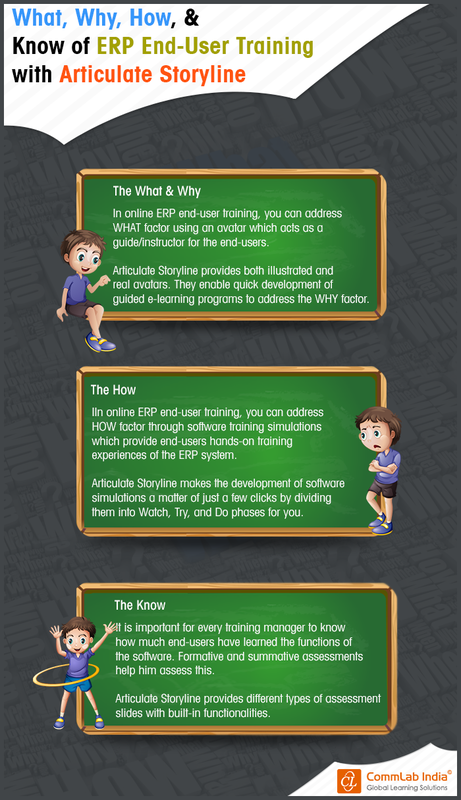 Well, articulate storyline can be one of the effective tool to deliver ERP end user training as it addresses the WHAT, WHY, HOW and KNOW factors of ERP end-user training. Want to know more in detail, how articulate storyline can address these factors, then check out the infographic below.